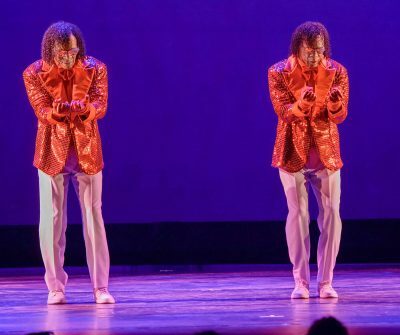 Identical twins Billy and Bobby McClain, known onstage as the Wondertwins, built their dance careers out of love and talent for upbeat broadway hip-hop. Yet last Sunday at the Institute of Contemporary Art, the Wondertwins used their talents to shed light on a different movement: the fight against police brutality. The dance duo performed their politically charged dance, titled “BLACK,” a documentary-style work about the effects of police brutality on the black community, at the ICA’s Dance UP feature Sunday. Dance UP is a program sponsored by World Music/CRASHarts that showcased diverse dancers and choreographers throughout New England, according to the show’s playbill. The McClains said “BLACK” was mainly improvisational, and they danced to a background of music, poetry and videos of violent arrests, court testimonies and viral videos in order to portray outrage and grief among black communities. Debra Cash, executive director of the Boston Dance Alliance, said the McClains are Boston natives who have been dancing together since they were young. At 10 years old, the Wondertwins were recruited to join Boston’s first professional street dance crew, The Funk Affects. By their teen years, the McClains broke off to become the Wondertwins, touring as the duo that would soon be performing on stages all over the world. In “BLACK,” the Wondertwins breakdanced to loud and sharp music. There were two white chalk outlines of bodies on the floor of the stage, where the twins fell once the videos of violence began to play. They lied still as the music, poetry and videos told the performance’s story. The last poem featured in the video, Maya Angelou’s “Still I Rise,” played aloud as the twins rose slowly from the chalk outlines. They stood seemingly exhausted, facing a projection of falling rain. The twins raised their arms, their silhouettes presenting as dark outlines in the falling rain. Pausing for a moment, they then turned slowly to face the crowd. The audience then rose for a standing ovation. The Wondertwins are known for their dignified approach to hip-hop and street dance, the McClains said in an interview with The Daily Free Press. As African American men, they said they object to the negative overtones that permeate the culture of hip-hop. According to the McClains,“BLACK” contrasts starkly to their usual routine of lively pop culture performances. “BLACK” followed their first performance in the show titled “That’s Entertainment” — an homage to vaudeville, Broadway, hip-hop and Las Vegas entertainment, according to the show’s playbill. The contrast between “BLACK” and “That’s Entertainment” was jarring for the audience, but even more so for the Wondertwins themselves, the McClains said. “BLACK” is heavy, emotional and difficult for the McClains to handle with composure, the twins said. “We do cry onstage,” Billy McClain said. Jason Harburger, of Newton, said he is a friend of the McClains and was in the audience for the ICA show. Reactions from the audience to “BLACK” varied “based on how far along individuals are in understanding the concepts of white privilege and systematic racism,” Harburger said. Harburger said “BLACK” made him feel sad and appreciative. 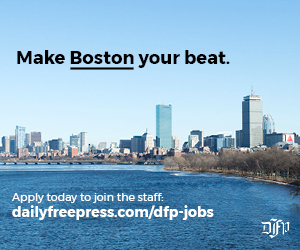 CORRECTION: A previous version of this article , as well as a version printed on Jan. 31, 2019, stated the Dance UP program is sponsored by the Boston Dance Alliance. In fact, the program is sponsored by World Music/CRASHarts. The online version reflects this change, and readers should note the error in print. Happy to see this review but the program was sponsored/presented by World Music/CRASHarts. I am the Executive Director of BDA brought in to create some context in the preshow talk.